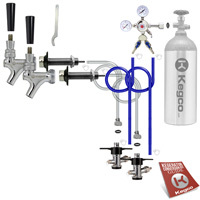 Comments: This was my first kegerator set. I have rented them in the past and they were difficult to get working and would make a mess. Plus there was a trash can and lots of ice or added cost involved, not to mension only one flavor and not all like the same beer. This kit was so simple to set up because everything was there and the instructions were exclent. There was no mess because of the quality and workmanship that was put into this product! Last but not least I have two flavors of beer to chose from!